Adina Warschawski reluctantly tried out for HaZamir: The International Jewish Teen Choir at the suggestion of her father, who thought she should be involved with a co-ed extracurricular activity since she attends Ilan High School, an all-girls’ Orthodox school in Ocean Township. Even though she was accepted, the 14-year-old pop music fan didn’t expect much. However, the Highland Park resident said she was pleasantly surprised to find she loved being part of the Central Jersey chapter. HaZamir is comprised of several hundred teens from 40 chapters, 10 of them based in Israel. There are five HaZamir chapters in New Jersey; in addition to Central Jersey there’s North Jersey in Caldwell, Jersey Shore in Tinton Falls, and others in Bergen County and the southern part of the state. 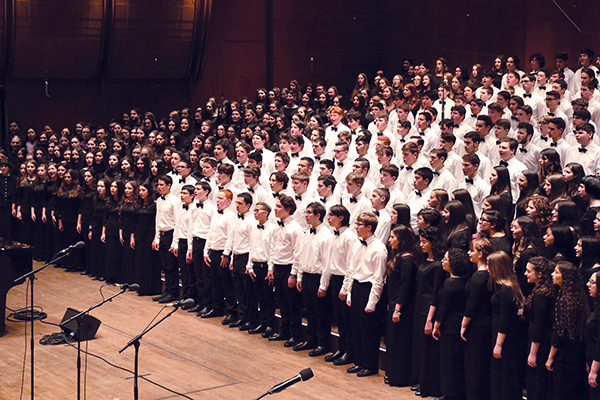 The 26-year-old choral group, affiliated with the New York-based Zamir Chorale foundation, will gather on Sunday, March 31, at the annual HaZamir concert at Lincoln Center in Manhattan. The concert is preceded by a Shabbaton in Stamford, Conn., for choir members. “This is a Jewish choir so it builds Jewish community through music and you make friends from all over the U.S. and Israel who love music,” said Joel Caplan, conductor of the North Jersey chapter and cantor at Congregation Agudath Israel of West Essex in Caldwell. Participation in HaZamir also bridges denominational divides. 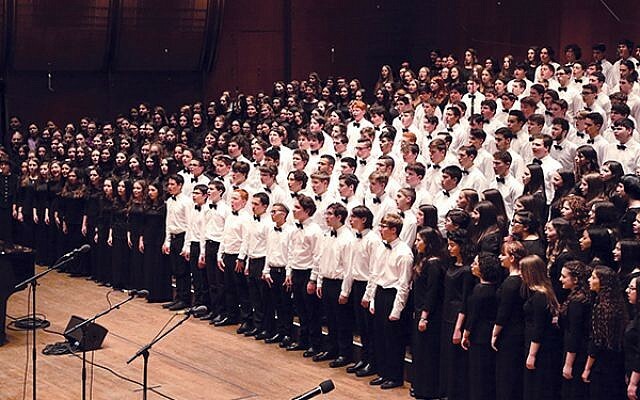 Susan Hornstein, conductor of the Highland Park-based Central Jersey chapter, cited the choral group’s “high level of Jewish excellence” in music, and extolled the community-building aspect of the group. “It is pluralistic, which is interesting because there are very few Jewish youth groups that have participants from all streams of Judaism,” she said. The pluralistic spirit of the group is evident in its local conductors. Hornstein is modern Orthodox; her group meets for weekly Sunday rehearsals at the Highland Park Community Center. Caplan’s chapter meets Sundays at his Conservative synagogue, and the Jersey Shore chapter meets Wednesdays at the Monmouth Reform Temple where its conductor, Gabrielle Clissold, is cantor. She said the chapters are generally given the music, which is often commissioned from American and Israeli composers, six to eight months in advance. Clissold said some are new compositions while others are arrangements of beloved Jewish texts connected to liturgy or Israel. This year’s set includes songs by Israeli composer Nurit Hirsh — best known for the songs “Bashanah Haba’ah” and “Oseh Shalom” — and American Cantor Benjie Ellen Schiller. Caplan of the North Jersey chapter likens the kinship felt among the singers to what players on a sports team experience. Ben Weiss, 18, of Ocean Township is a member of the Jersey Shore chapter. He was inspired to join after seeing a HaZamir performance in 2016. Ben, who has taken voice lessons and appeared in local musical theater, plans to study drama at Northwestern University. He said through HaZamir he has acquired friends from faraway states such as Minnesota and California, and deepened his love of Jewish music and prayer. “A prayer’s meaning revealed by song is one of the most beautiful things,” he said. Matthew Gonzalez, 16, of Parsippany learned about the North Jersey chapter through his older brother, Joshua, who was a member. Matthew, a junior, plans to become a music educator and his musical resume is extensive — he is in the Parsippany High School choir and plays saxophone in the band and marching band. 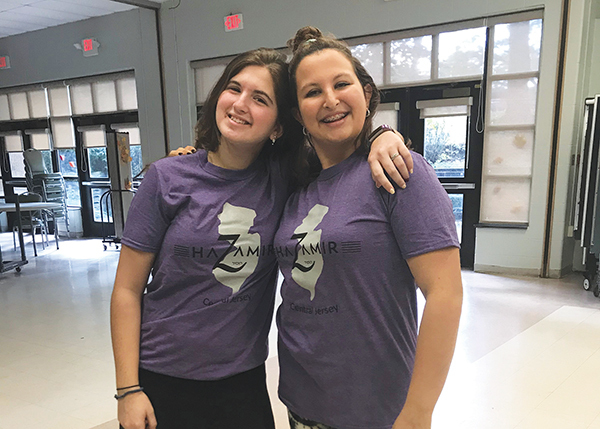 Bashi Rockman of North Brunswick, who is with the Central Jersey chapter, has been immersed in Jewish music most of her life through her father, Cantor Bruce Rockman of the Conservative Congregation B’nai Tikvah in North Brunswick. Bashi is taking a course in opera at Middlesex County College and hopes to pursue music throughout her life. It’s not only the teens who are inspired by the singing and camaraderie. Hornstein noted for the conductors, all of whom have backgrounds in music, the concert weekend feels like the coming together of “a real chevra,” or like-minded group. “It is a real labor of love,” she said. For information about joining the Central Jersey chapter, contact Susan Hornstein at 732-214-9632 or susanhornstein@yahoo.com; for Jersey Shore, contact Jennifer Weiss at jenandmitchweiss@gmail.com; and for North Jersey, contact Joel Caplan at 973-432-1454 or jcaplan@agudath.org. When: March 31, 4 p.m.